In 1915, the Lowe, Willard & Fowler Engineering Company was formed in College Point, Long Island, New Work. 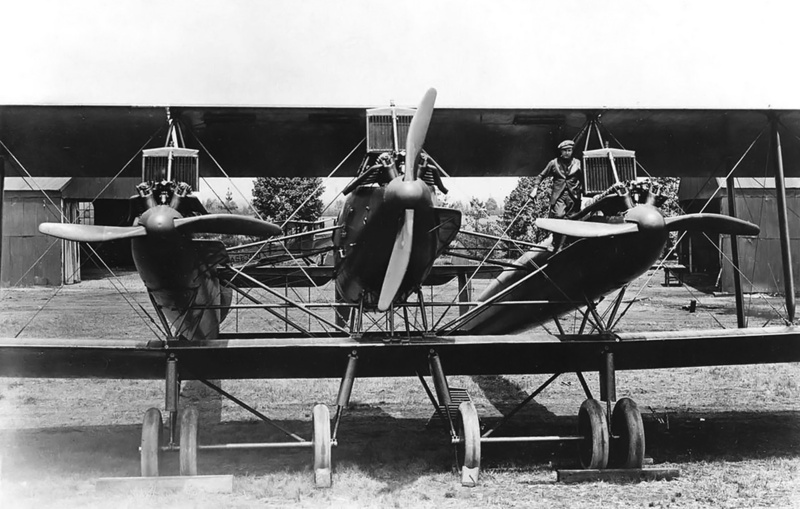 Of the founders, Edward Lowe, provided the financing; Charles Willard was the engineer and designer; and Robert Fowler served as the shop foreman, head pilot, and salesman. Willard was previously employed by the Curtiss Aeroplane and Motor Company and had developed a technique for molding laminated wood to form a monocoque fuselage. Willard was eventually granted U.S. patent 1,394,459 for his fuselage construction process. Previously in 1912, Fowler became the first person to fly west-to-east across the United States. The LWF Model H Owl in its original configuration with six main wheels. The engine on the central nacelle has a spinner, a single service platform, and a separate radiator. Note the numerous drag inducing struts and braces for the wings, nacelle, and booms. The business partnership was short-lived. In 1916, Fowler and Willard left the company, and Lowe assumed control, renaming the company LWF Engineering. By this time, LWF had become well-known for its molded wood construction process. However, management changed again as other financiers forced Lowe out. In 1917, the firm was reorganized as the LWF Engineering Company, with “Laminated Wood Fuselage” taking over the LWF initials. By 1919, LWF began design work on a large trimotor aircraft intended for overnight mail service between New York City and Chicago, Illinois. Other uses for the aircraft were as a transport or bomber. Designated the Model H (some sources say H-1), construction began before an interested party came forward to finance the project. 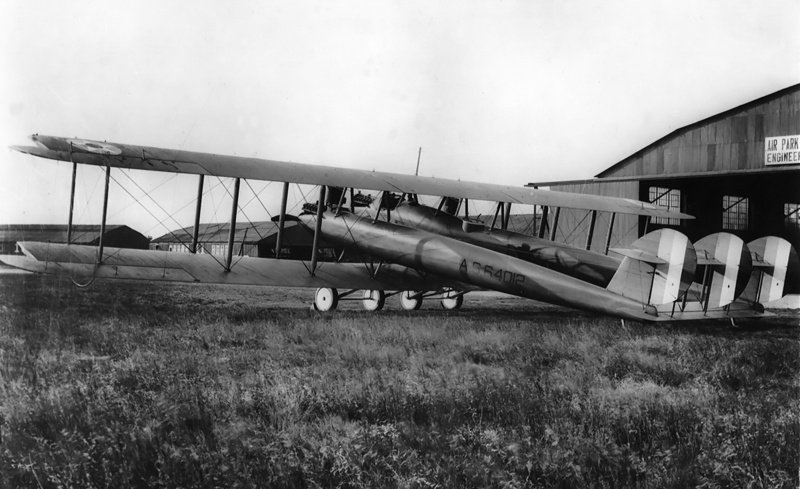 Because of its intended use for overnight mail service, the aircraft was given the nickname “Owl.” As construction continued, the United States Post Office Department declined to support the Model H. However, LWF was able to interest the United States Army Air Service, which purchased the aircraft on 16 April 1920. The Model H was assigned the serial number A.S.64012. In the original configuration, the Owl’s cockpit was just behind the trailing edge of the wing, and visibility was rather poor. Note the aircraft’s two horizontal stabilizers and three rudders. The smooth surface finish of the booms is well illustrated. The LWF Model H Owl was designed by Raoul Hoffman and Joseph Cato. Although the Owl’s design bore some resemblance to contemporary large aircraft from Caproni, there is nothing that suggests the similarities were anything more than superficial. The Model H had a central nacelle pod that was 27 ft (8.23 m) long and contained a 400 hp (298 kW) Liberty V-12 positioned in the nose of the pod. The cockpit was positioned in the rear half of the pod, just behind the wing’s trailing edge. The cockpit’s location did not result in very good forward visibility. Accommodations were provided for two pilots, a radio operator, and a mechanic. Mounted 10 ft (3.05 m) to the left and right of the central pod were booms measuring approximately 51 ft (15.54 m) long. The booms were staggered 24 in (.61 m) behind and 16 in (.41 m) below the central pod and extended back to support the tail of the aircraft. At the front of each boom was a 400 hp (298 kW) Liberty V-12 engine. Each boom housed fuel tanks and small compartments for cargo. The main load was carried in the central nacelle. The monocoque central nacelle and booms were made using LWF’s laminated wood process. The construction method consisted of a mold covered with muslin cloth. Strips of thin spruce were then laid down and spiral wrapped with tape. Another layer of spruce was laid in the opposite direction and spiral wrapped with tape. The final, outer layer of spruce was laid straight. The assembly was then soaked in hot glue and covered with fabric and doped. The resulting structure was about .25 in (6.4 mm) thick, was very strong, and had a smooth exterior. Where reinforcement was needed, formers were attached to the inside of the structure. The Owl was a somewhat sluggish flier and reportedly underpowered. However, its flight characteristics were manageable. It was the largest aircraft in the United States at the time. 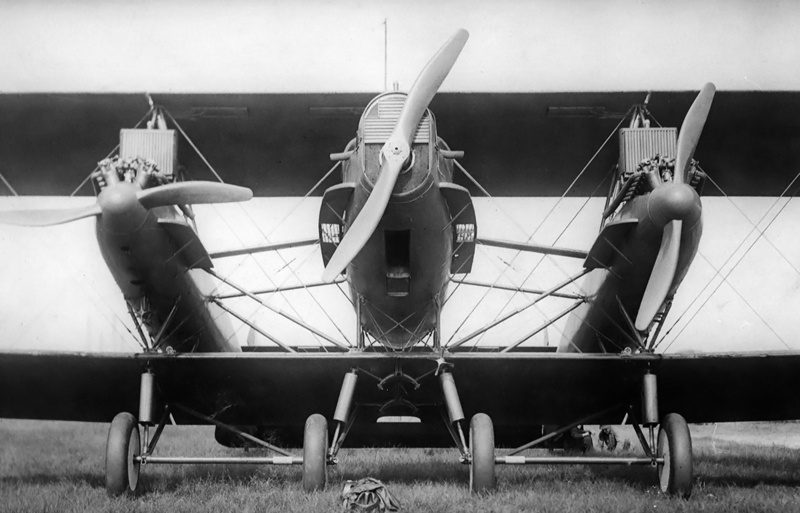 The nacelle and booms were mounted on struts and suspended in the 11 ft (3.35 m) gap between the Model H’s biplane wings. The wings were made of a birch and spruce frame that was then covered in fabric, except for the leading edge, which was covered with plywood. The upper and lower wing were the same length and were installed with no stagger. The wings were braced by numerous struts and wires. Large ailerons were positioned at the trailing edge of each wing. The wings were 100 ft 8 in (30.68 m) long with an additional 26 in (.66 m) of the 17 ft 8 in (5.38 m) ailerons extending out on each side. The incidence of the upper and lower wings was 4.5 and 3.5 degrees respectively. A bomb of up to 2,000 lb (907 kg) could be carried under the center of the lower wing. A horizontal stabilizer spanned the gap between the rear of the booms. A large, 24 ft (7.32 m) long elevator was mounted to the trailing edge of the stabilizer. Mounted at the rear of each boom was a vertical stabilizer with a large 6 ft 9.75 in (2.08 m) tall rudder. A second horizontal stabilizer 28 ft (8.53 m) long was mounted atop the two vertical stabilizers. A third (middle) rudder was positioned at the midpoint of the upper horizontal stabilizer. Attached to the upper horizontal stabilizer and mounted between the rudders were two elevators directly connected to the single, lower elevator. The lower stabilizer had an incidence of 1.5 degrees, while the upper stabilizer had an incidence of 4 degrees. 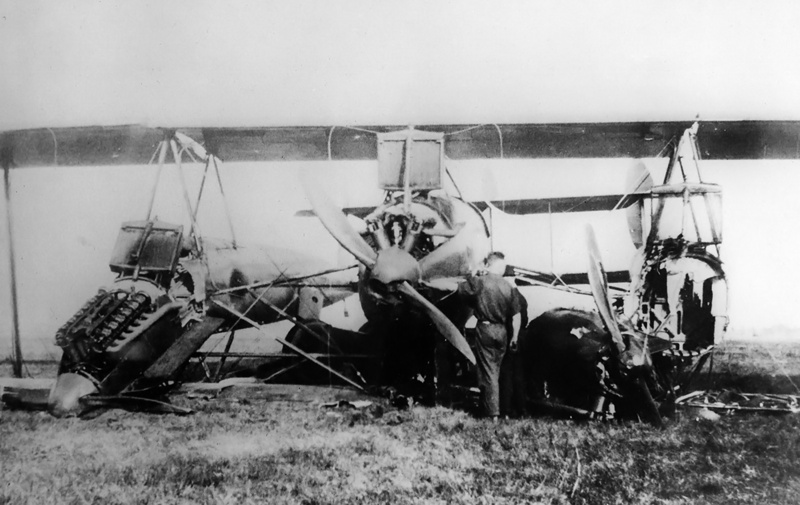 The Model H was heavily damaged following the loss of aileron control and subsequent hard landing on 30 May 1920. However, the booms, central nacelle, and tail suffered little damage. The Owl’s ailerons and rudders were interchangeable. Each engine was installed in an interchangeable power egg and turned a 9 ft 6 in (2.90 m) propeller. Engine service platforms were located on the inner sides of the booms and the left side of the central nacelle. The Owl was equipped with a pyrene fire suppression system. The aircraft was supported by a pair of main wheels under each boom and two main wheels under the central nacelle. At the rear of each boom were tailskids. The LWF Owl had a wingspan of 105 ft (32 m), a length of 53 ft 9 in (16.38 m), and a height of 17 ft 6 in (5.33 m). The aircraft had a top speed of 110 mph (117 km/h) and a landing speed of 55 mph (89 km/h). The Model H had an empty weight of 13,386 lb (6,072 kg) and a maximum weight of 21,186 lb (9,610 kg). The aircraft had a 750 fpm (3.81 m/s) initial rate of climb and a ceiling of 17,500 ft (5,334 m). The Owl had a range of approximately 1,100 miles (1,770 km). 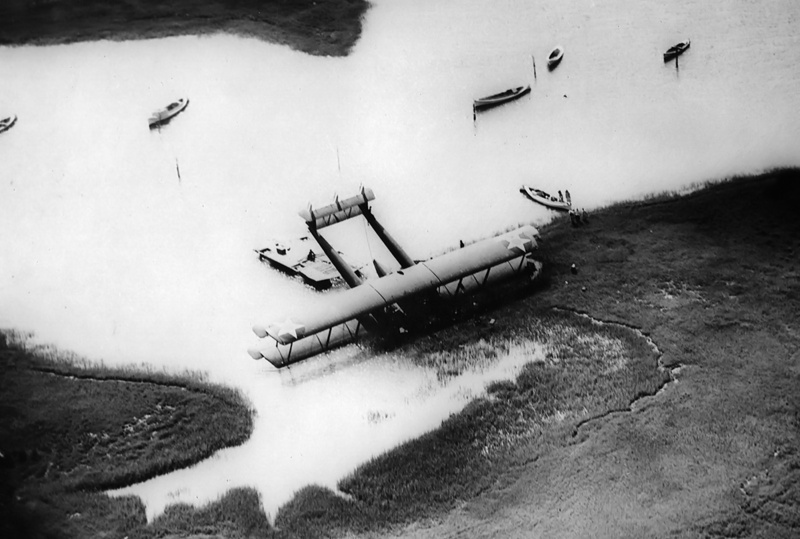 The Owl on its nose in the marshlands just short of the runway at Langley Field on 3 June 1921. The nose-over kept the tail out of the water and probably prevented more damage than if the tail had been submerged. 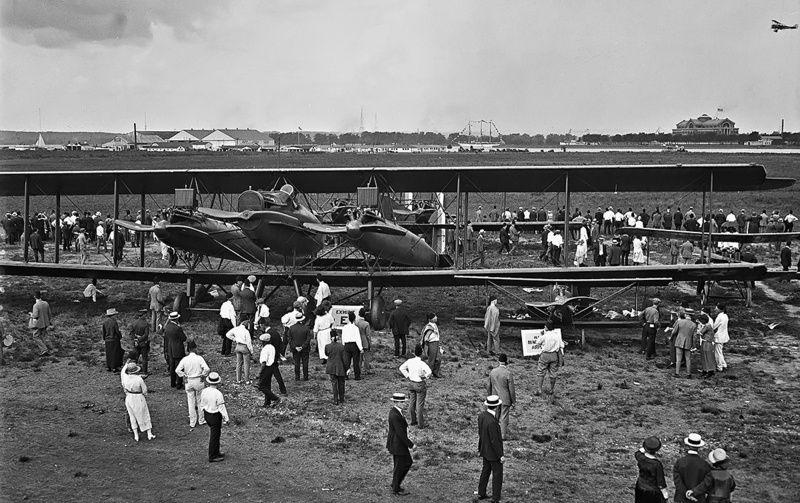 Although not complete, the Model H was displayed at the New York Aero Show in December 1919. On 15 May 1920, the completed Owl was trucked from the LWF factory to Mitchel Field. Second Lt Ernest Harmon made the aircraft’s first flight on 22 May. The aircraft controls were found to be a bit sluggish, but everything was manageable. An altitude of 1,300 ft (396 m) was attained, but one engine began to overheat, and the aircraft returned for landing. The second and third flights occurred on 24 May, with a maximum altitude of 2,600 ft (792 m) reached. The fourth flight was conducted on 25 May. Water in the fuel system caused the center engine to lose power, and an uneventful, unplanned landing was made at Roosevelt Field. Modifications were made, and flight testing continued. On the aircraft’s sixth flight, it had a gross weight of 16,400 lb (7,439 kg). The Owl took off and climbed to 6,000 ft (1,829 m) in 15 minutes. The engines were allowed to cool before another climb was initiated, and 11,000 ft (3,353 m) was reached in seven minutes. No issues were encountered, and the aircraft returned to base after the successful flight. The Owl in its final configuration with four main wheels. On the central nacelle, note the new radiator, lack of a spinner, service platforms on both sides of the engine, and the opening for the bombsight under the nacelle. A bomb shackle is installed under the wing on the aircraft’s centerline. On 30 May, a turnbuckle failed and resulted in loss of aileron control while the Owl was on a short flight. A good semblance of control was maintained until touchdown, when the right wing caught the ground and caused the aircraft to pivot sideways. The right wheels soon collapsed, followed by the left. The owl then smashed down on the right engine, rotated, and then settled down on the left engine, tearing it free from its mounts. The cockpit located near the center of the isolated central nacelle kept the crew safe, allowing them to escape unharmed. 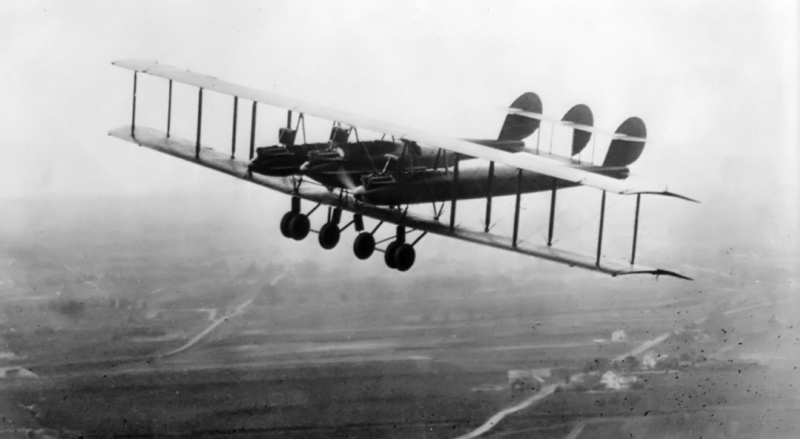 The Model H was repaired, and flight testing resumed on 11 October 1920. Tests continued until 3 June 1921, when Lt Charles Cummings encountered engine cooling issues followed by engine failure. The Owl crashed into marshland just short of the runway at Langley Field, Virginia. The aircraft ended up on its nose, but the crew was uninjured. The Owl was recovered and returned to the LWF factory for repairs. The new cockpit position just behind the engine can be seen in this rear view of the updated Owl. In addition, the gunner’s position is visible at the rear of the central nacelle. While being repaired, various modifications were undertaken to better suit the aircraft’s use in a bomber role. The cockpit was revised and moved forward to directly behind the center Liberty engine. The middle engine had a new radiator incorporated into the nose of the central pod. An engine service platform was added to the right side of the central pod so that both sides had platforms. A gunner’s position, including a Scraff ring for twin machine guns, was added to the rear of the nacelle pod. A bombing sight opening was added in the central nacelle. The ailerons were each extended 10 in (.25 m), increasing their total length to 18 ft 6 in and increasing the wingspan to 106 ft 8 in (32.51 m). The landing gear was modified, and a single wheel replaced the double wheels for the outer main gear. A bomb shackle was added between the center main wheels. The Owl flew in this configuration in 1922. To improve the aircraft’s performance, some consideration was given to installing 500 hp (373 kW) Packard 1A-1500 engines in place of the Libertys, but this proposal was not implemented. In September 1923, the Owl was displayed at Bolling Air Field in Washington, DC. The aircraft had been expensive, and it was not exactly a success. Quietly, in 1924, the LWF Model H Owl was burned as scrap along with other discarded Air Service aircraft. The Owl on display at Bolling Field in September 1923. Note the windscreen protruding in front of the cockpit. The large aircraft dwarfed all others at the display. This entry was posted in Aircraft, Between the Wars on 20 March 2019 by William Pearce. I wonder if the “Robert Fowler” mentioned in the article is the same gentleman buried in a San Jose cemetery only a few rows from where my grandfather and grandmother were laid to rest? Hello Steve – Yes, it is the same Robert Fowler. Thank you for your comment. Were pyrene fire suppression systems common at this time? I do not believe so. I think having any type of fire suppression in an aircraft was pretty novel in 1920.